You know that misguided family member that has good intentions, but always gets you something kinda weird presents? Well, that's Sephora. Much like my relatives who keep getting me bath supplies (I love that they want to get me girly things, but I have enough Bath & Body Works lotions to open my own store! And I'm allergic to 'em! ), Sephora seems to have severely underestimated my age and makeup tastes. Last year it was a lipgloss trio (which I didn't even bother to pick up, glosses just aren't really my thing). This year, it's a white pearl eyeshadow, a silvery eyeliner with a tinge of green and black mascara. I feel like I would have been all over these if I was 12 years old. Seriously, I would have worn them all at the same time and probably loved it. The shadow (called Alpine Summit) is a shimmery snow white, but not particularly well pigmented. It's like a diluted MAC Crystal Avalanche. Still, for subtle inner tear duct highlighting, or a light wash, it's not half bad. 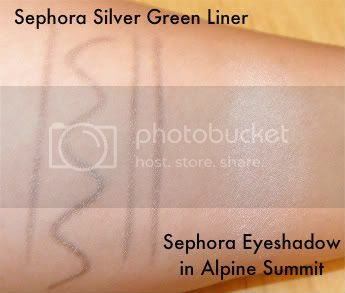 The liner is from the Sephora Nano line, called Silver Green. It's not very well pigmented at all, though quite creamy. It glides over my eyelids and leaves little color. Also terrible staying power. I can't comment on the mascara, since I haven't used it yet- but it appears to me as very basic, black mascara. Sephora is super sly, you know what I noticed? On the front of the box and in the emails you get reminding you to pick up your present, they feature full sized products. When you actually get it, they're minis. Sneaky, sneaky. I don't the size- actually rather happy that the shadow is 26mm because I'm obsessed with depotting into palettes. So while I'm happy to get free stuff, I really wish the items Sephora picked out were better suited for me. Had they been eyeshadow/liner in shades I loved, I'd probably get the full size. 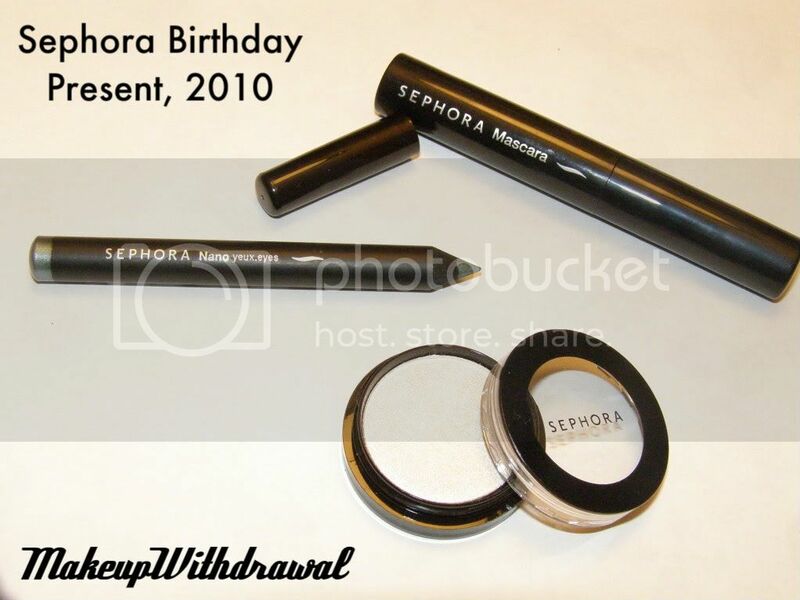 Anyone else get their birthday present from Sephora yet? What did you think?